Happiness in a woman can be very ephemeral: ask any woman, or any man! It burns down like a candle, and then gutters, and sputters, and darkness and recrimination follow. A TALE of two cripples. Or rather two temporarily disabled, but both on that familiar road, the one to recovery. The less important is moi: while I am currently still immobile and (a surprise, this) hurting rather more now than before the surgery, that will pass. The other cripple is less expected: Our bookstore. Jae, who painstakingly rebuilt it for a year after it was hacked and totally destroyed in November 2009, has taken something like a wrecking ball to it. She quit without notice on December 1 and flounced off to Australia taking the passwords, our mail, and keys with her. We are still waiting for an explanation, as I have had no word from her since then. So in the midst of other things I have had to find a sturdy and computer-savvy replacement, able to put up with my difficult ways. The bag of nails has been awarded to Mrs D. (a happily married Southern belle whom we have known for sixteen years) in Atlanta. I have organised from my hospital bed the emergency movement of pallets of books and supplies from England, Nebraska, and California to her in Atlanta to enable us to keep the bookstore running while we essay to get into our own locked storage units in Indianapolis -- and meanwhile answer queries from those baffled friends around the world who have written me and received no replies. As we males say in the more rational world which we inhabit: Go figure. To those who are still waiting, I apologise. AT 7:25 a.m. I call out to remind Jessica about the time, and she answers with one mumbled word so I guess she has no school this morning. Mrs D. reports overnight that she has found storage units in Atlanta, and we will shift stuff down from Indianapolis if we ever get the keys. We had 550 square feet of storage space in Indianapolis, but I don't know precisely where. Our units there were not temperature controlled, but in Georgia it would probably be a good idea. Jae is now communicating sporadically with Mrs D from her paradise Down Under. Unfortunately she has given us the wrong passwords, so we still cannot access the inventory. I am sure it was inadvertent. Mrs D. says: "She seems to be cooperating and [is] going to send the keys, so I don't think this is intentional." I suggest: "Temperature control is less important than humidity control, in my view." Books are hygroscopic. I write to my sister Carol about forward planning for a new publication of my mother's classic children's fantasy book, The Dawnchild. Mother left the rights to us four, now three, and long experience with families and testaments tells me that unless I take proper steps now, this is going to prove a fruitful thicket for lawyers to beat around in later. I tell Mrs D.: "I am in great discomfort today and will not be very communicative (unless you have more cheery news from Jae)." That she is returning eventually to the United States in March is cheery, for example. Jae's legal representative is still concealing from us what we have known for some days -- that his client is now 15,000 miles away from Indianapolis and has blithely taken the passwords and keys with her. I write in the evening to Mrs D.
I will read your long, long, long message later this evening as right now I have taken a fistful of painkillers. Your existing methods seem to be very productive, and I am happy to leave it to your judgment. There is a great deal . . . that you will never learn. A few nights ago I settled down expecting to brood all night long . . . but suddenly decided instead that the way to get a good night's sleep was to think instead of the three years of great happiness which Jae brought me. It worked. I still have not the faintest idea of what has caused her to cast off. THESE first two days out of the hospital have been tougher than I thought. Objectively speaking, I am more crippled than when I went in, but these things too shall pass, if I behave and follow the rules. Jessica knows I have been inundated with messages, and asks whether Jae knows I was in surgery. 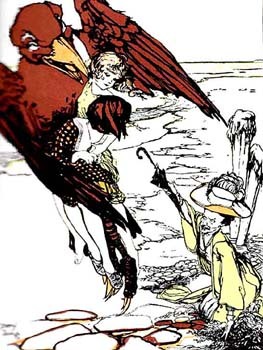 "It's odd she never sent you good wishes," she persists. I nod, but I defend my old colleague because Jessica adores her: Jae is the best friend I have had for years, I say, and she must have had good reason not to write; perhaps she is travelling, or she's wary of upsetting somebody else. Maybe the wealthy Australian, although German-born, is not really one of us at all; or maybe he doesn't know the whole picture. She seems to have cut off a lot of her old Facebook chums in the USA. Several have contacted me. I confess I have no time for such Facebook nonsense: that is for idle folks with a lot of time on their hands, and I still have three major books to complete and publish. That she suddenly quit -- after thrice denying it -- and scampered off to Australia has done damage to our bookstore, no question of that. She built it up single handed and devoted a lot of skill and inventiveness to expanding sales. But at least she is now freely assisting Mrs D., her successor. UP after rising several times during the night to swallow pillkillers. My leg has become very swollen. All to be expected, but I do confess that I had not anticipated that there would be this much pain after this surgery. Everybody was very reassuring on this score. K. comes at nine-twenty. and we set off for Wexham around 9:45 a.m. Nurse removes the stitches, says all has gone well, the pain down the thigh is "referred pain" from the serious violence done inside the leg a week ago, while I was "out" for three hours: "In the operating theater it sounds more like a carpentry shop," she explains cheerfully, and I wince. In a trice I am back in our neighbouring village of Billericay -- it is 1954 and I am a 17-year-old apprentice in the woodworking factory of Samuel Wernicke & Co, its halls ringing with circular saws, planing machines, drills, and hammering -- Dante's cacophony. 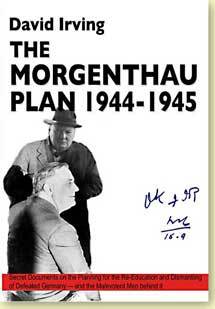 I limp out to the car, we drive on to Focal Point's storage unit in Slough and I find six books, but no copies here of The Morgenthau Plan. More problems. I pay the White Heather garage bill for the Pigmobile, £175 for the MoT and broken window repair; then lunch over the road at the Palmer Arms. Then on to Eton, my favourite High Street -- with ancient Windsor Castle rising out of the mists dead ahead across the common: I mail stuff at the little Post Office, buy paper and ink, and deposit cheques at Barclays, and am then driven back to Kew. It will be weeks before I myself can drive again. I pay £100 to K. for his time and gas, knowing that he needs it and that I could not have done it without him. I pause briefly at Kew Gardens station at the barber shop, but it is dreadful: one barber, East European perhaps, two clients, one dim light bulb and a lot of grim filth. After ten uncomfortable minutes on the very hard bench I rise and make my excuses. FROM Berlin, where he is researching on Himmler for me, Hugo, who is now my best friend, commiserates with me about female scattiness, and has his own horror-story to relate. "Ah well, these things are sent to try us," he writes. "Please feel free to make Kew your home for as long as you want or, as they say in Arabia (but not in Palestine, at least not any more) [he adds some Arabic text: ('my home is your home').]" I sleep until five p.m. very quietly and comfortably; then PLR phones about not having been able to send me a cheque last year. I get tuppence each time a book by me is borrowed from a public library. They sent it to Sloane Street, but it turns out, without a flat number. I ask Mrs D. this morning to inquire when Jae is returning to the United States -- just roughly, so I can switch on her Sprint phone as a favour and have it up and ready for when she sets foot back in civilisation. We both wish Jae well with her new life. It is high time she got married and did her duty to the human race. Mrs D. is happily married. "Luckily, I'm with a man who . . . thinks I'm beautiful and tells me often (which is sweet). I tell him we won't get his eyes examined any time soon," she adds. She's going to need that sense of humour if she works for me. I spoke to Mullocks today: Himmler's holiday home [on the Tegernsee] near Munich was where these items were stolen after the war. Apparently the Red Cross had been using it in 1945 and immediately they left, the purloiner of the items had gone in there on orders to ready the place as a billet for American Officers. I reply: "Yes a large batch of stuff was looted by Red Cross nurses, and sold by one of them to the Hoover Library in California where I have used it; for example, his early photo albums." Tonight I am feeling the worst ever since the surgery. I guess that is the way it goes. One leg is bloated to the size of the Goodyear Blimp. Blimp: that's appropriate. I've still got the B---- Limp. I HEAR Jessica closing the front door around eight a.m. heading for school; she will go straight to the airport after that and then fly to Berlin with her girlfriends this evening. So I'll be alone for the next three days. I've stocked up with glasses of water and painkillers. "... 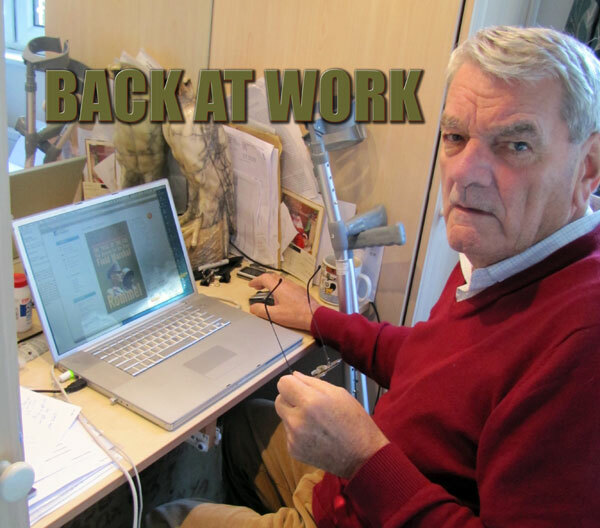 I am delighted that the holocaust denier and Nazi apologist David Irving was imprisoned in Austria for his crimes." Yes, he said "crimes." 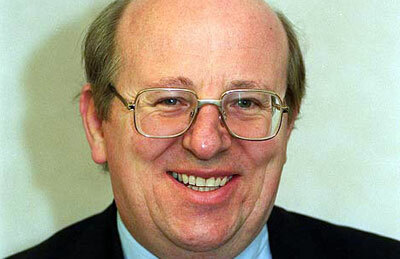 Yes, Mike Gapes (above). 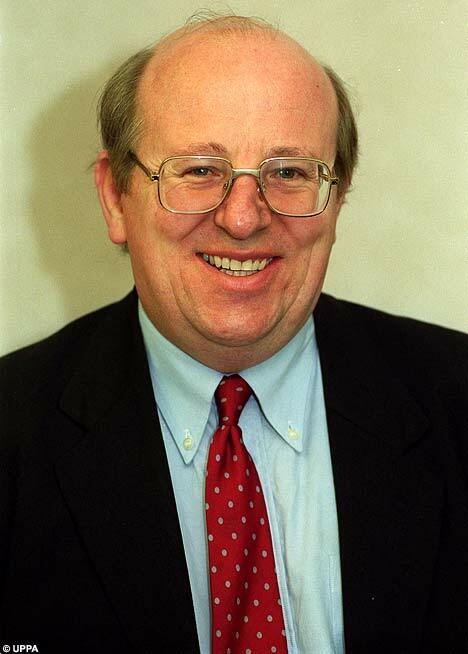 As a linguist, one wonders mildly, as one always does about all non-English names: Does Gapes rhyme with "apes" or does it come in two syllables, Gap-es, like herpes. I think I shall place him somewhere between the two. That puts him in good company. "I cannot really believe she intends to emigrate to Australia," I add. "She swore to me that she would not, in a thousand years. Keep me informed of low stocks on titles please. Now you have a good overview." Then lightning strikes the powderkeg. Far away now from civilization, Jae has "spat the dummy," as Australians say in their own colourful vernacular. The suddenness is volcanic. It's like the old schoolboy trick of pouring concentrated nitric acid into an "empty" beaker rinsed with raw alcohol standing on a lab bench near a friend (don't try this trick at home, folks). An extraordinary note has come to Mrs D. laced with such ripe language that the latter good soul declines even to repeat it to me. La Jae objects to my "implying that I stole his mail and 'his' keys". Rather more ominously, Jae has even said: "I have bent over backwards to be helpful to you (and him), but that ends now." I am pole-axed by this new turn. One glance at the photo album gives her more insulting remarks the lie. The message is an enigma. For a while I doubt whether Jae has written it herself: the vocabulary used has teutonic touches. Perhaps it was written for somebody else's benefit. What baffles me is why Jae, who has spent a hard year brilliantly rebuilding the successful bookstore, should now be trying to shoo away her successor who has taken over and is successfully picking up up the pieces. After three of the most intellectually rewarding years with Jae, I am sad at losing her but I can well see it is time for her to move on and raise a family while she can. But we are all entitled to opinions, and I make no secret that Gerwich ain't my cup of tea. . . She needs an action man, adventure, experience and inspiration in a field into which she can throw her courage, her wide horizons, her talents for inventiveness and organisation, and thinking abilities. Money is no substitute for character. But, that said, those are my private views. He will never hear them and nor did she. I never tried to sabotage their relationship. Guys don't do that kind of thing. I stood aside and did much to make it possible -- although her November visit to him in Baltimore and her subsequent vacation in Australia meant that our bookstore would be rudderless at the height of the Christmas season. Mrs D., who has known me five times longer than you have, is baffled by the language you have chosen. . . What you wrote yesterday is not only hurtful but wrong. . .: despite my misgivings about your future fiancé . . . I have never tried to sabotage your relationship with him. On the contrary I have repeatedly stated to you that I hope that all your dreams come true; I was the one who made that relationship possible, seating him next to you at all times on the coach, disappearing discreetly each evening in Poland when you were with him, even giving you three days off in Kraków to fly to Munich at the crucial moment [to meet his mother], and paying for six days all your gas and hotel charges en route from Indianapolis to Baltimore and back in November, when you had your first two-week long tryst with him. I also rush[ed] signed cheques to you before you left for Australia, so that you would not be without funds at this important crossroads in your life; I left your Sprint phone active until the last moment, paying the bill myself long after you resigned, enabling you to communicate with him, and I left your [credit] card active in case you run into difficulties. . . I end: "I wish you well, as always." I can't help feeling there is something darker, deeper, afoot. BEGINNING to feel more human again. 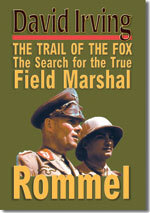 I spend the afternoon and evening rebuilding our famous Rommel biography in InDesign from the original PageMaker file, for our new hardback edition. I begin uploading the huge file with all the illustrations at nine p.m. It takes until 10:54 p.m to upload just the interior. Meanwhile I phone Mrs D.
The poison-pen letter has upset her badly. She is unhappy about the strange vortices she has now found herself sucked into -- dealing with trucking companies, printers, storage firms, etc. She thought she was just taking over a bookstore. She begins talking about Aries and Capricorns, and I have to change the subject, but firmly. I am also encouraging her to hope for the best, but always to fear that the worst may come first, and be ready for it. K. COMES at one-thirty p.m. and we have Sunday lunch at the Palmer Arms in Dorney at my invitation, and coffee in Eton High Street afterwards. A productive day's work. I go to bed around eight p.m. and fall fast asleep: Jessica then rings the doorbell at 9:30 p.m., back from Berlin, looking very slick and strongly resembling "the cat wot got the cream." She spots a large jet-black bruise on the back of my operated thigh, and frets over it and browses the Internet for symptoms of DVT. None of the other standard symptoms is present however, so I eventually get back to sleep. My own youngest daughter, my friend and guardian: and she is one of the best females I have come across in life. UP at nine a.m. after a night disturbed by Jessica's worries. Still, I have survived. The bruise is round the back of my right thigh. Out of sight, out of mind. Jae has sent a warm message from Australia to Hugo in Berlin. From what he tells me, she seems to be very happy. Her new man takes very good care of her, and she couldn't ask for anything better. "He is so sweet and genuine," she enthuses to my friend. "I don't know how you could tell so early on that we would be perfect for each other, but we are. Totally compatible in every way. I feel like the luckiest woman in the world. I am immensely happy here and enjoying the most perfect life I could ever have imagined." That brightens my whole day. I have always put her happiness above anybody else's. She has found another rainbow to chase after, a happiness mitigated only by the sober reflection that she felt the same way about Andzrej, the student whom she dashed off to Poland to meet as a teenager and marry; and about the bright young man in Indiana who loyally saw her through university and supported her until this latest man came along. We all hope that this time it is for keeps. She is a lovely girl, and she deserves it. Hugo then tells me: "By the way, I have ordered Hitler's War (in German) for [his host]. It will be interesting to know what she thinks." it will never come. The publisher Buchdienst Kaden is a . . . and we have started proceedings against him. The book does not exist in German publication. Reverting to his report on Jae, once my former closest colleague and mentor, I add: "I am very glad that Jae is happy; truly glad. I expect she wrote those lines intending you to pass them on to me. . .
"She . . . was equally happy when she was with me in England, but happiness in a woman can be very ephemeral: ask any woman, or any man! It burns down like a candle, and then gutters, and sputters, and darkness and recrimination follow." Was der liebe Gott verhüten möge. MARKUS W. in Bavaria asks: "Hello Mr Irving. 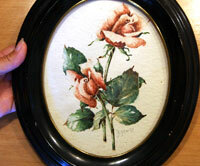 Are there are any people imterested in the water-colour of Roses painted by AH?" I reply: "Not these last few months. You turned down the last offer." Hitler gave the painting to Eva Braun, as the documents with it establish, and that makes it a truly unique item. She was one of History's more loyal females. But economic times now are hard and investors are more cautious. Markus refused to lower his price marginally for the firm customer I found for him. Bad decision.